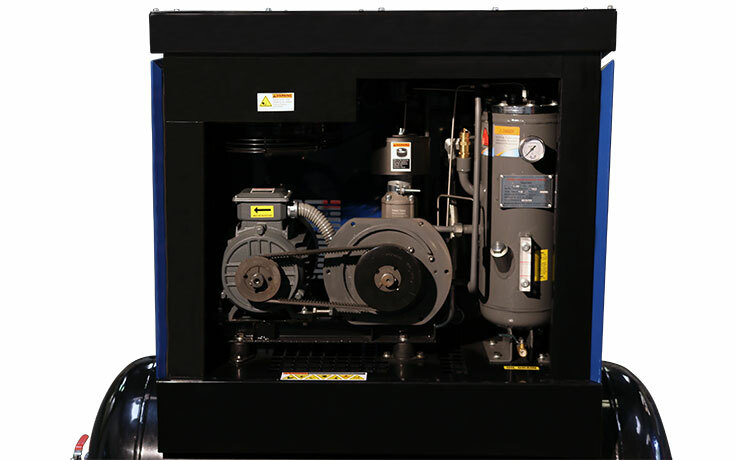 With high performance, efficiency and reliability in mind, the BendPak Hush-Quiet RS7580H‐603 rotary screw air compressor meets the compressed air needs of high-volume automotive shops and facilities around the world. Whether it's tires, general maintenance, fleet, vehicle body repair/modification, paint or an entire dealership, count on the RS7580H-603 for all your compressed air needs. 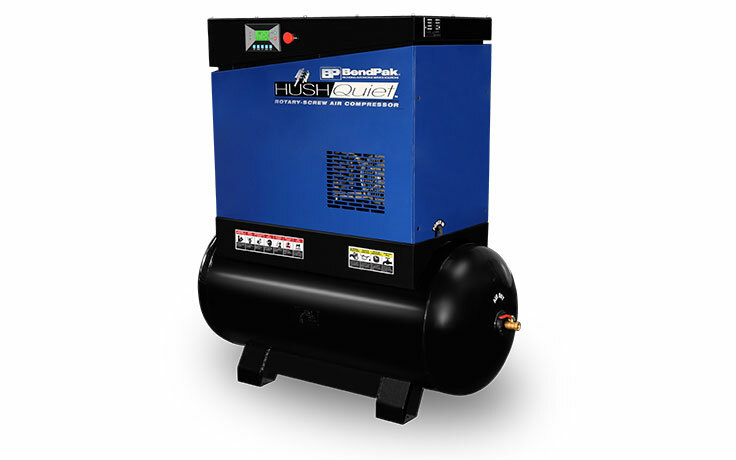 With high performance, efficiency and reliability in mind, the BendPak Hush-Quiet RS7580H‐603 rotary screw air compressor meets the compressed air needs of high-volume automotive shops and facilities around the world. This includes tire, general maintenance, fleet, vehicle body repair/modification shops, paint shops and dealerships. 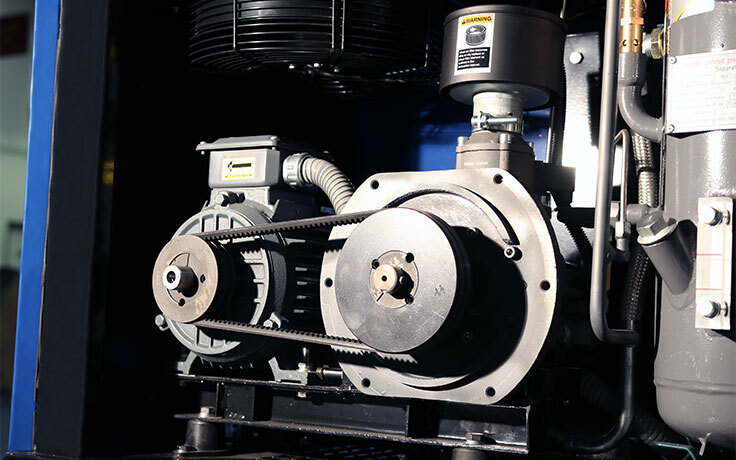 The asymmetric profile screw set is driven by a 7.5 HP electric motor and triple‐belt drive. Atmospheric air is drawn through the inlet filter into the asymmetric profile screw set, and this is where air is compressed. BendPak's specially developed PowerCool synthetic lubricant is injected into the screw set to serve three important roles: coolant, lubricant and sealant. Under normal conditions, the air reaches a maximum temperature of about 176°F / 80°C during compression. 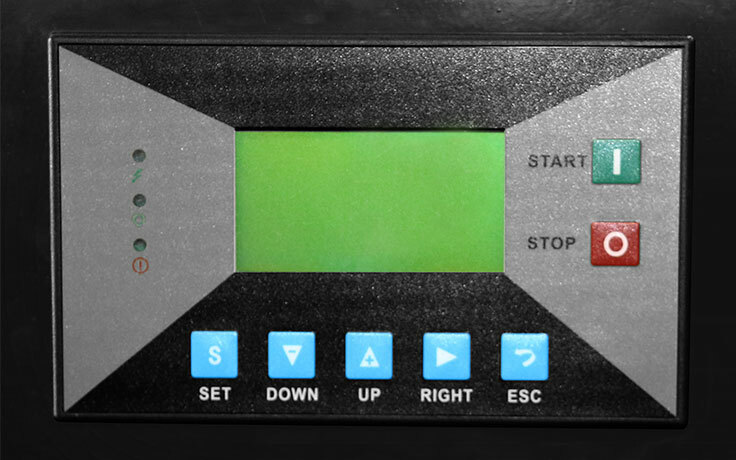 ​Then the dual‐stage separator removes any cooling fluid from the compressed air. The cooling fluid is recycled, passing through the cooler and micro‐filter, then all the way back to the point of injection. Meanwhile, the air compressor regulates and optimizes air and fluid temperature with a highly sensitive thermostatic valve. The air emerges from the separator cartridge with a ​total fluid content of less than 2 mg/m³ before passing through the minimum pressure check valve and, at last, through the after-cooler. In the after‐cooler, we further reduce the air temperature between 5 and 10 degrees above ambient. Most of the moisture in the air condenses here and is easy to separate and remove in the downstream centrifugal separator. Now the air can finally leave the air compressor through an outlet and be applied to any automotive job you need. Offers easy and immediate access to data. Click the button below to add the BendPak RS7580H‐603 7.5 HP Rotary‐Screw Air Compressor to your wish list.